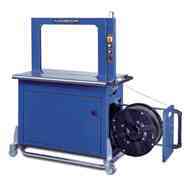 Vectra - Variable Speed Turntable up to 9 RPM; EconoStretch film carriage; 4,000 pound turntable. 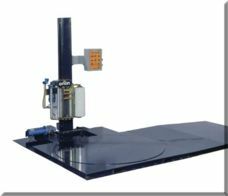 Spectra - Variable Speed Turntable up to 14 RPM; 260% prestretch (standard); 5,000 pound turntable. L-77 - Variable Speed Turntable up to 12 RPM; 200% prestretch (standard); 4,000 pound turntable. 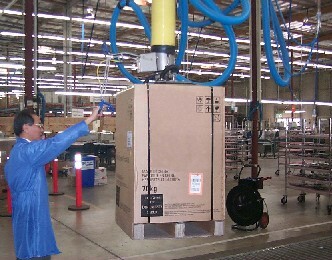 L-77S - has a surround deck for added convenience during loading by electric walkie or hand truck. Also can be mounted in-floor to eliminated the need for a ramp. L-66 - Variable Speed Turntable up to 14 RPM; 245% prestretch (standard); 4,000 pound turntable. L-55S - Variable Speed Turntable up to 16 RPM; 245% prestretch (standard); 6,000 pound turntable. 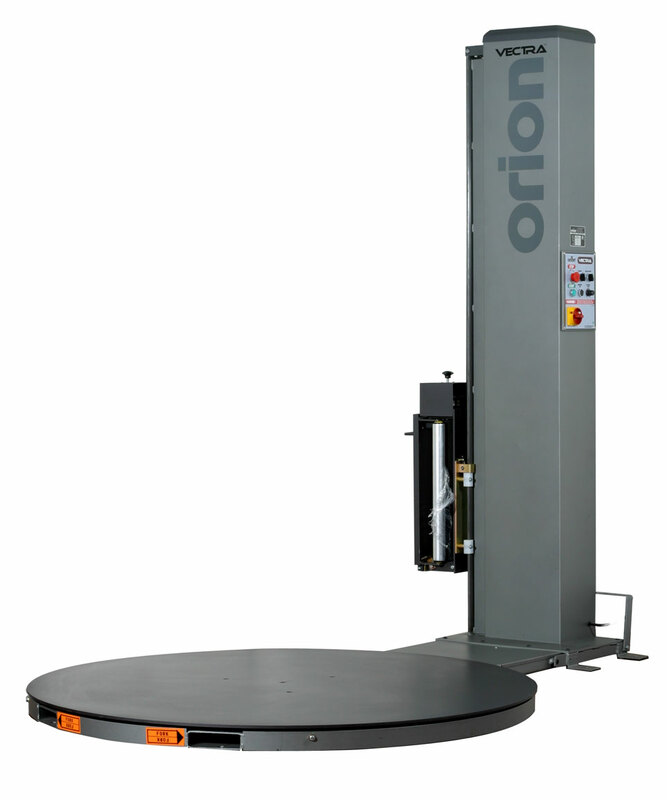 The Orion Vectra, Spectra, and L series machines are semi-automatic, turntable style wrapping machines designed for economical and efficient unitization of pallet loads with stretch film which has been pre-stretched. 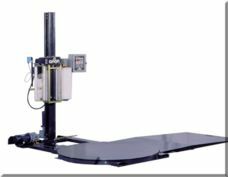 These machines are used in operations using hand trucks and electric walkies (w/ the addition of a ramp) or with fork-lifts and can dramatically increase throughput rates and lower cost per load compared to manual (hand) stretch wrapping operations. EconoStretch - Vectra film delivery system is engineered to be easy and safe. Powered Prestretch - Spectra and L Series Insta-Thread film delivery system is engineered to accurately pre-stretch film at a fixed rate and deliver it to the load at a constant tension level. Economical - High performance film delivery system yields 200% for the L-77 and 245% prestretch (standard) for the L-66 and the L-55. 260% for the Spectra. Durable - Rugged 100% structural steel construction for years of reliable operation. Capacity - Handles 55" x 55" (max) loads weighing up to 4,000 pounds (standard) for the L-77 and L-66 models, 5,000 pounds for the Spectra, and up to 6,000 pounds (standard) the L-55S model. 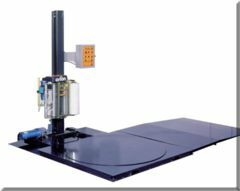 Height Adjustment - Automatically adjusts for various load heights (up to 84" maximum standard on L Series, 90" for Spectra). Non-proprietary Parts - Non-proprietary replacement parts are "off the shelf" and can be purchased from your supplier or from Novatech. Self-Threading - Spectra and L Series Self-threading Insta-Thread™ carriage makes loading film fast, safe and easy. Portable - Forklift portable base design with front and rear lift tubes for easy machine transport. Roping - Adjustable film roping bar for strong interlocking of load to pallet. Power - Requires 115 volt, single phase, 60Hz electrical. 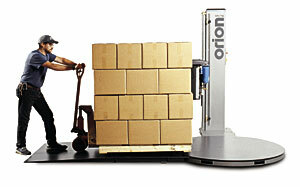 Warranty - Orion warrants the above equipment for 3 years for all parts, and 5 years for structural components.